The Wheeler Center is named for the late Burton K. Wheeler, who earned fame as the “fighting progressive” U.S. 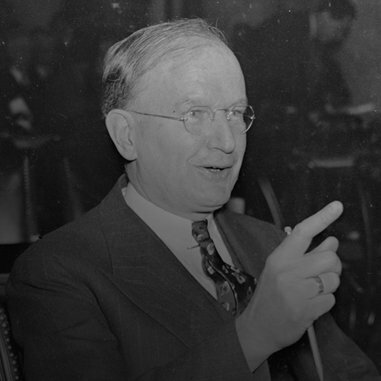 Senator from Montana from 1923 - 1947. He is best remembered for his epic battle to block President Franklin Roosevelt's attempt to pack the Supreme Court, for his Senate investigation of corruption in the Harding Administration's Justice Department, and for his lifelong defense of civil liberties and his commitment to economic opportunity for all Montana citizens. The Senator passed away in 1975. In Montana, we understand the importance of working together to do what’s right for our state. The Wheeler Center encourages Montanans to listen and learn from each other so that together we can work toward solutions that help strengthen Montana. I applaud the Wheeler Center for their commitment to preserving these Montana values. Asserting, as did Senator Wheeler, that enlightened discussion of public policy is the cornerstone of our democracy, the Center is the only educational forum in the state where issues that affect Montana and the region are taken up in a regular, systematic and rigorously non-partisan way. Although the Wheeler Center has a close working relationship with Montana State University, it is an independent, non-profit organization, with its own board of directors. The Center depends entirely on private contributions for its programs and administration. In 1975, the Greater Montana Foundation (GMF) sponsored the first Burton K. Wheeler Memorial Lecture. Ed Craney, pioneering Montana broadcaster and founder of the GMF, enlisted the support of the two eldest sons of Burton K., John and Edward, in producing the first lectures and in the expansion of the lecture series into a more formal public policy center. The Burton K. Wheeler Center was thus established at Montana State University in 1988 under the guidance of historian and then-Academic Vice-President Michael Malone. In 1991, Dr. Malone asked Dr. Gordon Brittan, of the MSU philosophy faculty, to assume the Director's role, a position he held until June 2008. He was succeeded by Dr. Ralph Johnson, Professor of Architecture at MSU, then in 2013, Dr. Eric Austin, Associate Professor of Political Science became the fourth Executive Director of the Wheeler Center. We are open to communication! Please contact us with any questions, comments or concerns and we will get back to you as soon as we are able. To make a donation by credit card, visit our donation form. Chuck Tooley, Billings, MT, the longest-serving Mayor of Billings, later served as Director of MSU’s Urban Institute in Billings. His company, Tooley Communications, offers consulting services in marketing, strategic communications, and public policy. He has served on the boards of Big Sky Economic Development Authority, Rocky Mountain College, Montana Arts Council, The Population Institute, and U. S. Conference of Mayors. A U.S. Army veteran of the war in Vietnam, Tooley speaks widely on citizenship and leadership. McKee Anderson, Dillon, MT, is a rancher and President and Executive Director of The Montana Food Distributors Association. He obtained a Business degree from Washington State University, with postgraduate classes in Personnel Management and Statistics. A licensed high time instrument pilot, he is a successful businessman in agriculture, energy production and sales, insurance, and real estate, with continuing interests in managerial finance. His recreational interests include working on the ranch, flying, traveling and hunting. Shiell Anderson, Livingston, MT, attended college in Bozeman and law school in Missoula. He is a former state legislator, former chair of the Montana Transportation Commission, and lifelong Park County rancher. He has served on a number of non-profit boards, including the Park County Community Foundation and Community Health Partners in Livingston. He is married with two children. Robin Wheeler Azqueta of West Palm Beach, FL, and West Glacier, MT, is the great-granddaughter of Sen. Wheeler. She holds an MBA and is a marketing consultant. She is President and General Manager of Advantage Wireless Communications, Inc. She is married with two young children. Bob Brown, Whitefish, MT, served in the Montana House and Senate for 26 years, as Senate President his final term in office, while also working as a high school history and government teacher. He served as Montana Secretary of State 2001 - 2005, and was a senior research and teaching fellow at the UM Center for the Rocky Mountain West and the Mansfield Center. Bob and his wife have two grown daughters. Eve Byron is an award-winning journalist who spent the past three decades at newspapers mainly in Montana and Colorado. Her work included a nine-month stint as the Mike Wallace Investigative Reporting Fellow with the University of Michigan's Knight Wallace Fellows program. She joined the National Institute on Money in State Politics in January 2014 — better known as FollowTheMoney.org — to help implement new communication and outreach activities, including traditional, social, and mixed media. She works with news organizations, nonprofits, and academics to inform them of the reporting and research opportunities as they follow the money trails in state politics. Cathy has a background in manufactring operations, with both the General Electric Company and Avon Products. In 1981, she moved from New York City to Montana with her husband and two sons. She enjoyed a 30 year career with Montana State University. She served as the director of Labor Relations and Personnel Services, and later University Relations. As the Vice President of Communications and Public Affairs, she served as the lobbyist and media spokesperson for MSU. University Marketing, Web Communications, Publications, News Bureau and Montana PBS were also in her division. Cathy has a Bachelor’s degree from Cornell University in Russian Studies and a Masters in Higher Ed from MSU. She has taught courses in the MSU College of Engineering and the College of Business. Waded Cruzado, Bozeman, MT, serves as the 12th president of Montana State University, a position she has held since January, 2010. In addition, President Cruzado currently serves on the boards of the Higher Education Resource Services (HERS), TIAA-Cref Hispanic Advisory Council, International Student Exchange Program (ISEP), US Bank, as well as the Association of Public and Land-grant Universities (APLU). Lorents Grosfield, Big Timber, MT is a third generation cattle rancher in Sweet Grass County. Water and other Ag issues brought him to politics. He served in the Montana Senate for 12 years, where his chairmanships included the Judiciary and Natural Resources Committees. He enjoys fly fishing and travelling, and recently returned from a 500 mile hike on the Camino de Santiago across northern Spain. Marc C. Johnson, Manzanita, OR, is the former president of Gallatin Public Affairs and is now “of counsel” to the firm. He is the former chief of staff to Idaho Gov. Cecil D. Andrus, and past president of the Andrus Center for Public Policy at Boise State University. Bill Jones is a fourth generation rancher from Harlowton. His family's Twodot Land & Livestock Co. was founded in 1908 and is now in its sixth generation of ownership. The former Executive Director of the Gallatin History Museum in Bozeman and the immediate Past Governor of the Montana District of Kiwanis, Bill believes that, "Volunteer service is the rent you pay for the space you occupy in your community." Bill has served on several boards including Humanities Montana, the Montana State University President's Advisory Council, the Montana Farm Bureau Federation, the Montana History Foundation, the Museum Association of Montana, Wheatland Memorial Healthcare, Mountain West Farm Bureau Mutual Insurance Co. and the 6-Mill Levy campaign in 1988, 1998, 2008 and 2018. Bill and his wife Debbie have been married for 44 years, have 3 grown children and 6 grandchildren. Cameron Van Orman of Broomfield, CO, and West Glacier, MT is the great-grandson of Sen. Wheeler. He holds an MBA from the Kellogg Graduate School of Management at Northwestern University and a BA from Dartmouth. He is a Sales & Marketing professional in the High-tech industry and currently is the Senior Vice President of Product Marketing for CA Technologies. Bradley Snow, Livingston, Montana, is a former board chair and the great-grandson of Senator Wheeler. He teaches history at Montana State University. His book, Living with Lead: An Environmental History of Idaho's Coeur d'Alenes, 1885-2011, is scheduled for publication in early 2017. Kendall Wheeler, Aiken, SC, Palm Beach, FL and West Glacier, MT, is the granddaughter of Sen. B. K. Wheeler, for whom she was named and with whom she enjoyed a special relationship as they shared the same birthday. She started her own small business and ran it successfully for twenty years. Bill Yellowtail grew up on his family's cattle ranch on the Crow Indian Reservation in Montana. Holding a degree in geography from Dartmouth College, Bill has been a rancher, educator, fishing guide, Montana State Senator and congressional candidate. An expert canoeist and fly fisherman, he was named Angler of the Year for 1991 by Fly Rod and Reel magazine. He served as Regional Administrator for the U.S. Environmental Protection Agency during the Clinton administration, with responsibility for six western states and 27 Indian Tribes. Bill received the Dartmouth Environmental Network's 1994 annual award in recognition of his outstanding contributions to protection of the environment, and he received the Mary G. Ross Award for exemplary service from the Council of Energy Resource Tribes in 1999. He serves on the Boards of Directors of Humanities Montana, the Burton K. Wheeler Center and the National Audubon Society as well as the Advisory Council for the MSU College of Letters and Science. An Associate Professor of Political Science and Coordinator of the Master of Public Administration program at Montana State University, where he teaches courses including public policy, public management, organization theory and administrative ethics. His research focuses on inter and intra organizational processes of decision making in contentious environments, and has appeared in Public Administration and Management, Administrative Theory and Praxis, The Journal of Public Affairs Education and elsewhere. Dr. Austin’s professional career prior to completing his PhD at Virginia Tech included managing program unitis in both public and non-profit organizations. Dr. Austin has and continues to work as a trainer and consultant providing technical support and capacity building for organizations ranging from large, federal agencies all the way down to small, volunteer based non-profits. Holly has earned double bachelor degrees from Montana State University in Economics and Agricultural business in May 2015. She was a fellow for the Burton K. Wheeler Center her last semester in college and believed in the mission of the Wheeler Center so completely that she applied for the Administrative Assistant position right before graduation. She is also employed at Rocky Mountain Credit Union in Bozeman where she works in lending.